Royal Botanic Gardens Melbourne are home to more than 12,000 different species of plants and a natural sanctuary for native wildlife. 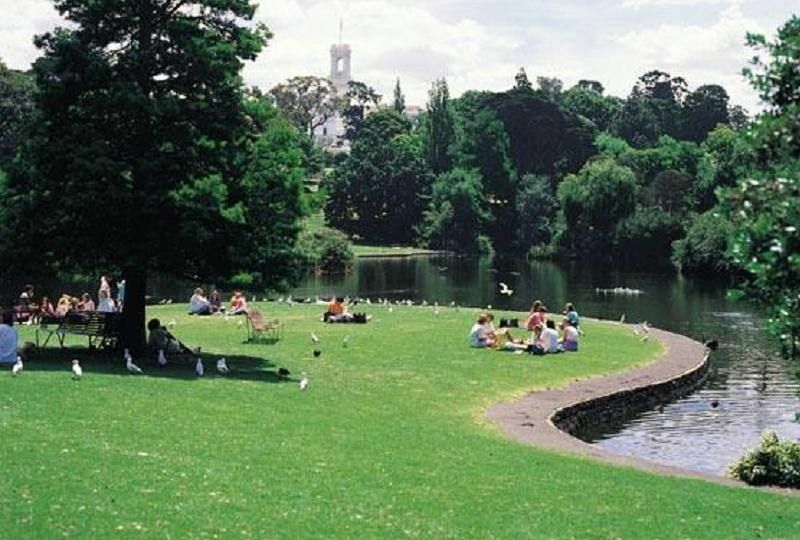 Across the Yarra River southeast of Melbourne city centre, Royal Botanic Gardens Melbourne are an ideal place for unhurried walks, jogging on designated routes, plant spotting, or just lazing away the day. They're open to the public daily — and free. The Royal Botanic Gardens are actually in two Victorian locations: the 35-hectare site in the city, and the vastly larger, 363-hectare Royal Botanic Gardens Cranbourne located 55 kilometres southeast of Melbourne. Features of Royal Botanic Gardens Melbourne include the Ornamental Lake, National Herbarium of Victoria, Old Melbourne Observatory, Australian Rainforest Walk and Water Conservation Garden. A walk around the entire Melbourne gardens should take two to three hours at a medium pace. Native wildlife at Royal Botanic Gardens Melbourne includes black swans, bell birds, cockatoos, kookaburras, possums, wallabies. The Royal Botanic Gardens Melbourne visitors centre is located at its southwestern edge opposite the imposing Shrine of Remembrance, a memorial to the Anzacs and all those who came after them in the many wars and conflicts in which Australia took part. Information about the gardens and guided tours is available at the centre. The gardens are about a 15-minute walk from the city centre if you want to go on foot. Various trams on the St Kilda route should take you to the Domain Rd Interchange. Walk towards the Shrine of Remembrance and the Old Melbourne Observatory. From Flinders St Station, take tram 8. If you wish to drive, 2-, 3- and 4-hour parking is available in the streets surrounding the gardens. Parking for the disabled is available along Birdwood Ave.